National Insurance Company Limited (NIC) is one of the oldest and most preferred general insurance firms in the country. The insurance firm is a subsidiary of the government-owned General Insurance Corporation of India (GIC), and is headquartered in Kolkata. The company has a pan-India reach with around 1,998 branches across the country and 14,902 employees. In terms of the Gross Direct Written Premiums (GDWP), the company is the second largest general insurance company in India. Digital policy purchase and renewal: Customers have the option of purchasing or renewing their car insurance policy through the insurer’s official website. However, if you would like to buy your policy through more traditional means, you can always walk into any one of the insurer’s branches in your city. Discounts/Bonus: Policyholders can avail attractive discounts when they purchase a motor insurance policy from National Insurance. In order to reward safe driving, the insurer provides a No-Claim Bonus for every claim-free year. In addition, if you purchase your motor insurance policy from the insurer’s official website, you can also claim certain online discounts. Customer Service: If you would like for a company representative to assist you or if you have certain queries, you can call the insurer on their toll-free number or send them an email on their dedicated email ID. The insurer also has an online chat feature on their official website. In order to start the chat, you will simply have to enter your name, email ID, and telephone number. Speedy Claim Settlement: On the insurer’s official website, you will find a detailed, step-by-step process on how to lodge/file a claim. If all the steps mentioned are followed and the policyholder submits the necessary documents without delay, the claim will be settled by the insurer in a timely and hassle-free manner. Choice of Coverage: National Insurance provides prospective policy buyers 2 types of coverage options. You can either choose a Liability-Only Cover, wherein you will only be covered for the death/injury of a third party and for third-party property damage (within Rs.7.5 lakh). 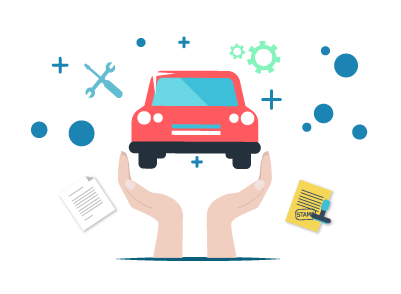 You can also choose to avail the Package Cover or the Comprehensive Motor Insurance Policy, which will give you a more inclusive and exhaustive coverage. Firstly, you will have to visit to the insurer’s official website, and then click on the ‘Motor Insurance – Private Car’ tab on the menu. Once you have navigated to the Motor Insurance page on the website, you can click on the ‘Buy Online’ option. You will then be re-directed to another page in which you will have to key-in certain details about yourself and your vehicle. Once you have filled in all the necessary information, you can pay your premium via your Credit/Debit Card. The risk cover will commence only after the premium is paid. If you require any assistance during this process, you can always reach out to the insurer’s Customer Service team on the toll-free number that’s mentioned on the website. Why should one Opt for National Insurance Company Limited? Availability of 2 Coverage Options: While it is mandatory for every vehicle owner to have an active motor insurance policy, insured members can choose between a Liability-Only Coverage or a Comprehensive Coverage, as per their requirements. Instant Policy Renewal: In addition to being able to purchase a policy online, National Insurance also provides members the added benefit of renewing their insurance policy directly through the insurer’s official website. Discounts: Policyholders can avail discounts and bonuses, which can help reduce the overall premium payable. Range of Insurance Products: The insurer has a very varied insurance product portfolio. In addition to motor insurance, the insurer also provides health insurance, personal insurance, rural insurance, and several other such insurance solutions to meet the needs of their diverse consumer base. Damage occurring only to the tyres will not be covered. However, if the tyres are damaged along with the car, the insurer will pay 50% of the cost of replacing the tyres. The Package/Comprehensive Motor Insurance policy will cover liabilities, damages caused to one’s own vehicle, loss of vehicle, and injury/death occurring to self/co-passengers. Accidents or bodily injury/death caused due to the vehicle owner or driver driving when he/she was under the influence of alcohol or other narcotic substances. Transit by rail, air, road, etc. Acts of terrorism, malicious acts, strikes, and riots. The Insured Declared Value or the IDV is the maximum amount that the insurer is liable to pay to you in case of total loss or theft of the vehicle. This means that if your car happens to get stolen or is damaged beyond repair in an accident, this is the maximum sum that you can claim for. The insurer is not liable to pay you anything more. The determining factor of a vehicle’s IDV is its current market value excluding the rate of depreciation that occurs with time. The value of any accessories that are not factory fitted and the vehicle’s registration cost will also not be included in the calculation of the vehicle’s IDV. The rate of depreciation that will be taken into account as per the age of the vehicle is listed in the table below. Over 5 years Based on an agreement between the policyholder and the insurance company. In case of theft or loss, the concerned person will have to immediately report it to the Police. Post this, the claim form will have to be collected and filled up by the policyholder. This filled and signed claim form will have to submitted to the policy-issuing office along with all required documents and the FIR (if applicable). A Loss Assessor/Surveyor may be appointed by the insurance firm, if necessary. Once all documents are verified, the claim will be settled by the insurer and the payout will be made. In certain cases, the insurer may make a provisional payment if the final claim payment is still pending. *The steps mentioned above are only indicative and not exhaustive. For more detailed information, you will need to contact the insurer. A copy of the registration certificate of the insured car. A copy of the driving license of the policyholder. Policy documents, or policy card. FIR issued by the local police station – depending on the severity of the accident. Claim form that has been attested by the policyholder and owner of the stolen vehicle. Copy of the registration certificate of the insured vehicle. Copy of the driving license of the policyholder. FIR issued by the local police station stating that the car has been stolen. Copy of the registration certificate of the vehicle that has been damaged. FIR issued by the local police station. Details of the damages caused to the vehicles as issued by the insurance surveyor or the network garage. How do you define ‘depreciation’ in car insurance? The reduction in the vehicle’s value due to general wear-and-tear that occurs with time is called depreciation. Depreciation can play a large role in determining your vehicle’s IDV or Insured Declared Value. The No-Claim Bonus is a certain bonus/discount that is provided by the insurer to reward you for not making any claims during the policy tenure. The No-Claim Bonus for the present policy year can help reduce your premium payable in the following year. Yes, purchasing a motor insurance policy is mandatory for every motor vehicle owner. You are required to, at the very least, have a third-party liability-only cover, by law. However, you can also consider purchasing a comprehensive insurance policy since it offers a higher amount of coverage and is more inclusive. Yes, you can purchase/renew your policy on National Insurance’s official website and the premium payments can be made by credit/debit card. What documents should I carry when driving my vehicle? While driving, ensure that you carry your car’s Insurance Certificate, Registration Certificate, PUC Certificate, and the driving licence of the person who is driving the vehicle. I have bought Maruti car before 2years and by default showroom has provided me an insurance with National Insurance and am renewing with them online. The customer service and premium is better. I have no claim. Its a comprehensive insurance and policy coverage is also better,. I have paid 9K per year through online and got the insurance paper. The renewal process was very easy and used to call during renewal. There was no claim with National Insurance. I never contacted with the customer service and there is no requirement. The premium is reasonable. It is a comprehensive insurance and does not cover bumper to bumper. IDV was good and made the premium through online. My friend is working in National Insurance so he will help me for the renewal. I don't have claim experience. Am using the service for 20 years. The premium is reasonable and the customer service is good. I am satisfied with the policy coverage. They send only hard copy and not got the soft copy. Earlier I had a car insurance with National Insurance and it was average. They took lot of time for the claim process. They need to improve the customer support. It was lower amount and they have provided the claimed amount. They have wider range of workshops. "Good. Can do better "
The previous year I had my car insurance with National insurance. It was for my i20 vehicle. There was a claim and the process was not up to the mark. They prolonged the process and I was not very satisfied with their services. They need to be more proactive. "Good Protection for four wheeler"
I have taken National insurance policy through online portal, they have suggested this insurance company. The IDV value is good initially they came me upto 100% of cover, like bumper to bumper because its a comprehensive plan. I have wagon R car it was insured with them. "They should improve the services"
Prolonging my claim with National, there was no explanation about the claim settlement. I file my claim, there is no proper from them. They are giving wrong email address and asked me to contact some other details when i contact their branch office. Applying a claim process is quite tough and i have to visit their branch office and their no help from their office however the helpline customer care service is good. There is no cashless claim facility. "Very Good Brand name policy"
I never used any facilities from the car insurance. For the sake of the policy, i just took this policy. The premium amount is higher when i compared with other company policies however they are providing the same benefits. At the time i purchase my vehicle, the policy has been given my Maruti Showroom. They have reduce the premium amount and there should be some unique features there in the policy. The policy was given to me from the car agency when i purchase my car. It was around 4.75 lakhs i have received as IDV value. I have taken the policy in the month of June 2017. I'm not sure about the bumper to bumper. The car agency has taken care of the documentation part. This is the first party insurance. I do have a claim experience with National Car Insurance. Its a lengthy process to apply for a claim. After all the process, it took lot of time to receive the settlement amount. Because of the lots of time and the lenghthy process i have moved to other company. They are not dealing with the customer in a proper way. They need to improve a lot. I have purchased the car insurance policy in the end of June. I have made a premium amount of Rs. 7000 and i have not availed the services of bumper to bumper and cashless garages. My agent has suggested me to take this policy. I have done the documentation through online and it was good. The service got delayed for receiving the hard copy.